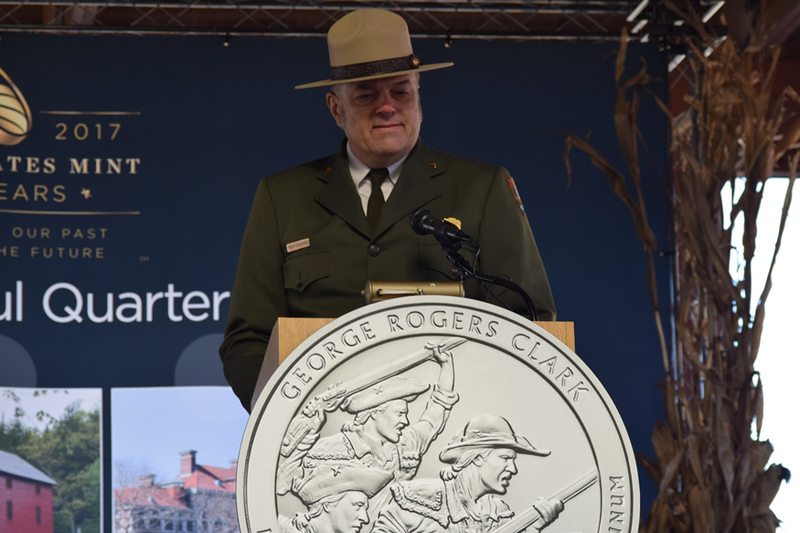 On Tuesday, Nov. 14, quarters honoring George Rogers Clark National Historical Park in Indiana were formerly introduced to the public. Dave Motl, Acting Deputy Director of the United States Mint, presents George Rogers Clark National Historical Park quarters struck on the first day of production to Frank Doughman, the park’s Superintendent, during the Nov 14, 2017 launch ceremony in Vincennes, Ind. U.S. Mint photo by Jill Westeyn. 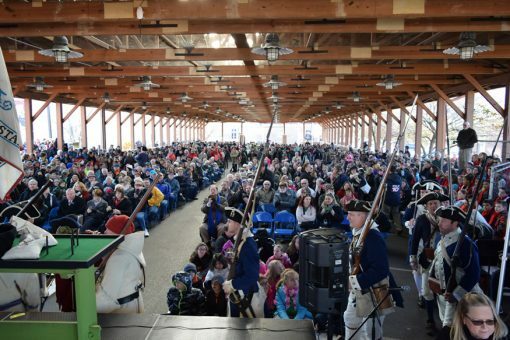 Around 1,800 people attended the launch ceremony hosted by officials from the United States Mint and National Park Service. Some 1,100 schoolchildren received a George Rogers Clark quarter for free. A crowd of about 1,800 people witnesses the Nov. 14, 2017, ceremonial launch of the quarter. U.S. Mint photo by Sharon McPike. 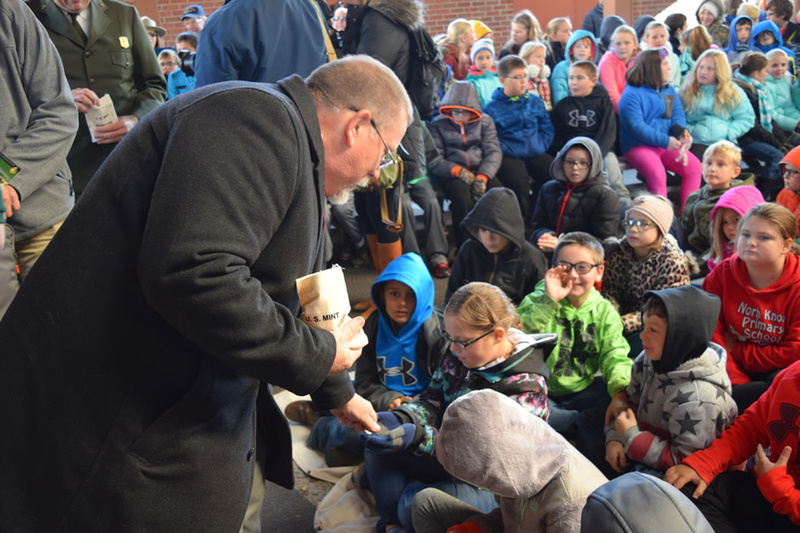 Dave Motl, Acting Deputy Director, United States Mint, passes out new George Rogers Clark National Historical Park quarters to children attending the launch ceremony. U.S. Mint photo by Sharon McPike. The George Rogers Clark Memorial. The memorial is located in the area where Fort Sackville once stood. 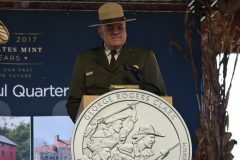 The newest quarter’s design depicts Clark leading his men to take the fort. U.S. Mint photo by Sharon McPike. The coin’s reverse depicts Clark leading his men through the flooded plains approaching Fort Sackville. 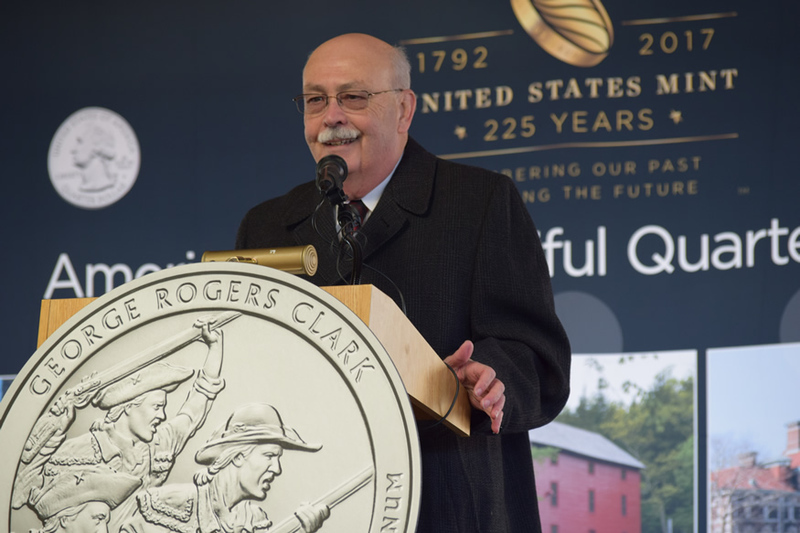 "This new coin is a reminder of the unity of effort and spirit that our predecessors embodied and demonstrated," said Acting Deputy Director David Motl, who represented the U.S. Mint. 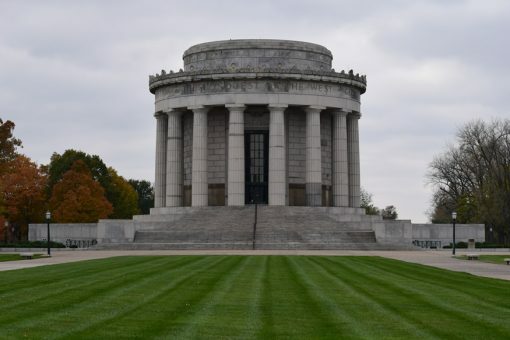 "The foresight, comradery, and determination of George Rogers Clark and his men are important examples to all of us as to how individuals from different backgrounds are able to come together, work toward achieving the same objective, and create a lasting impression." 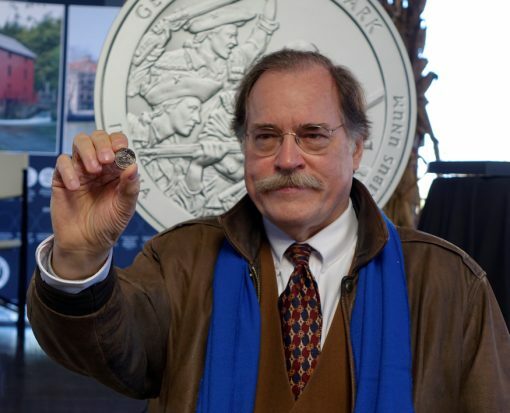 City Council Member Dan Ravellette served as Master of Ceremonies during the quarter launch ceremony. U.S. Mint photo by Sharon McPike. 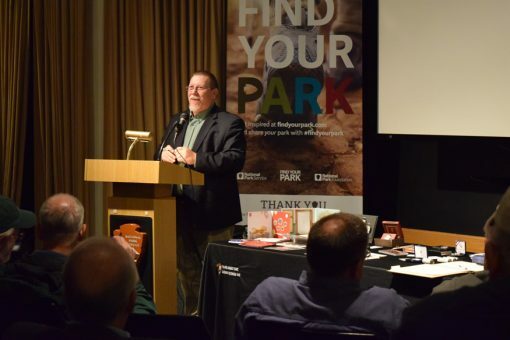 Frank Doughman, Superintendent, George Rogers Clark National Historical Park, addresses the crowd at the ceremony. U.S. Mint photo by Sharon McPike. 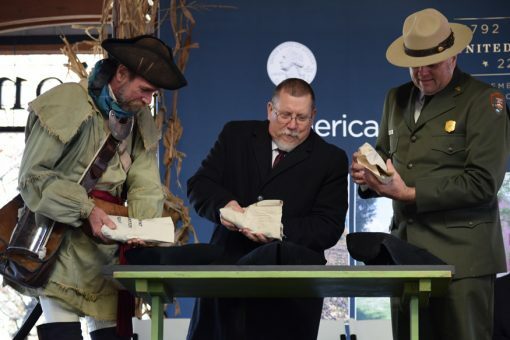 Joe Herron, Chief of Interpretation for George Rogers Clark National Historical Park participates in the ceremonial launch. U.S. Mint photo by Sharon McPike. 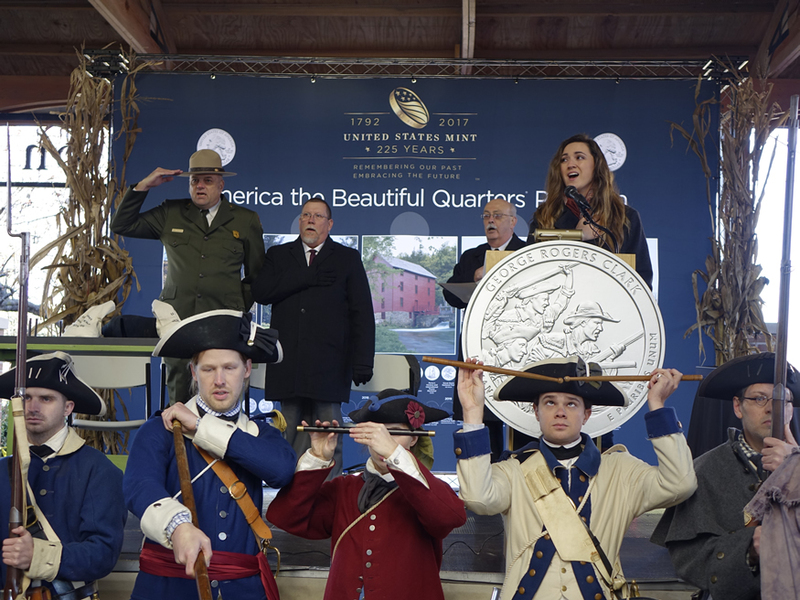 A George Rogers Clark re-enactor, United States Mint Deputy Director Dave Motl, and George Rogers Clark National Historical Park Superintendent Frank Doughman participate in the ceremonial coin pour during the launch of the George Rogers Clark National Historical Park quarter. U.S. Mint photo by Sharon McPike. 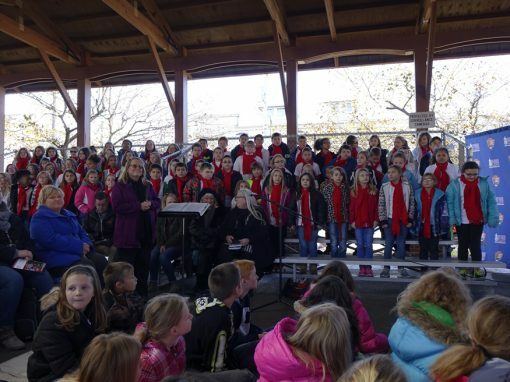 Others ceremony highlights included performances by the George Rogers Clark Fife and Drum Corps and the Vogel Elementary School Choir, and an appearance by United States Mint Artistic Infusion Program artist Frank Morris, who designed the quarter’s reverse. Hannah Swan, a musician and former Vincennes University student, sings the National Anthem during the George Rogers Clark National Historical Park quarter launch in Vincennes, Ind. 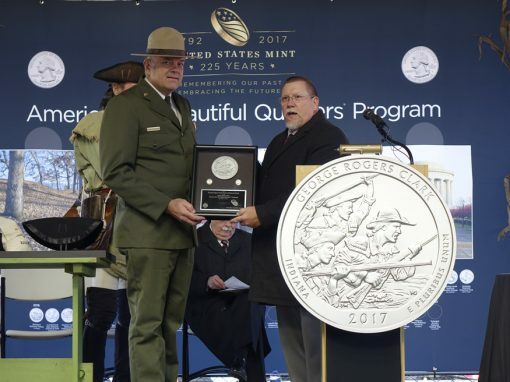 The coin is the 40th release in the United States Mint America the Beautiful Quarters® Program. U.S. Mint photo by Jill Westeyn. 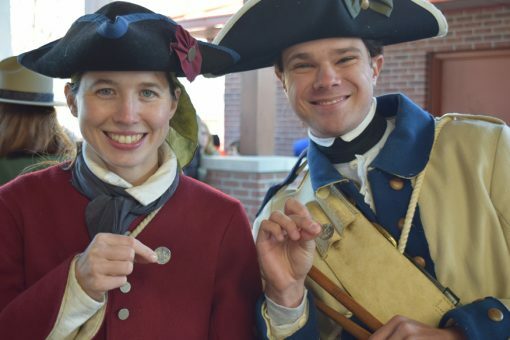 Two members of the George Rogers Clark Fife and Drum group hold new George Rogers Clark National Historical Park quarters. U.S. Mint photo by Sharon McPike. The Vogel Elementary School Choir performs during the ceremonial launch of the quarter. U.S. Mint photo by Jill Westeyn. Artistic Infusion Program artist Frank Morris proudly holds a new George Rogers Clark National Historical Park quarter that he designed. U.S. Mint photo by Jill Westeyn. After the quarter ceremony, many attendees took part in the traditional coin exchange. 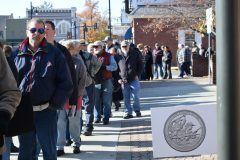 About $42,000 in P-mint mark quarters were swapped for cash. 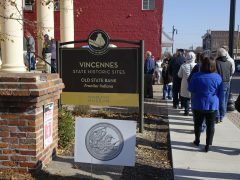 The coin exchange happened at Old State Bank. U.S. Mint photo by Jill Westeyn. An eager public lines up to exchange cash for new George Rogers Clark quarters. U.S. Mint photo by Jill Westeyn. 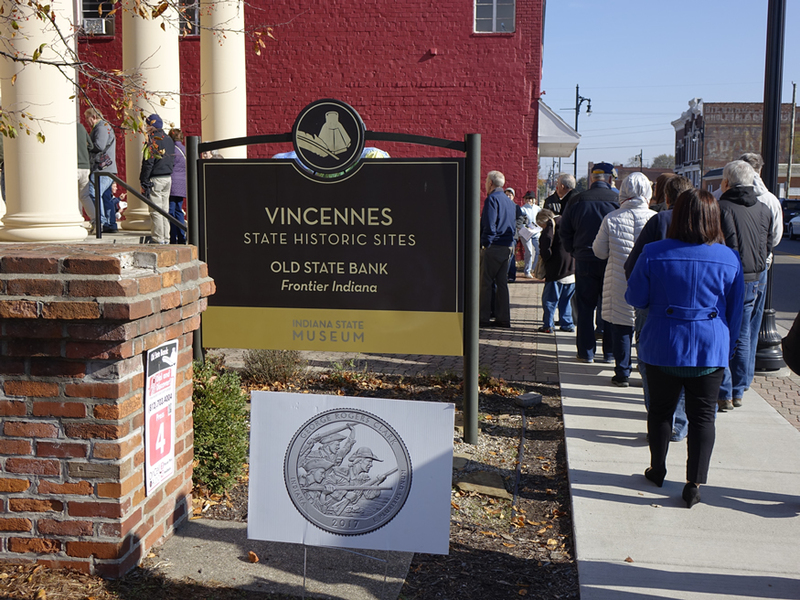 Another highlight for 125 collectors and local enthusiasts was a coin forum held on the evening before the ceremony where attendees listened to and asked questions of Mint officials. 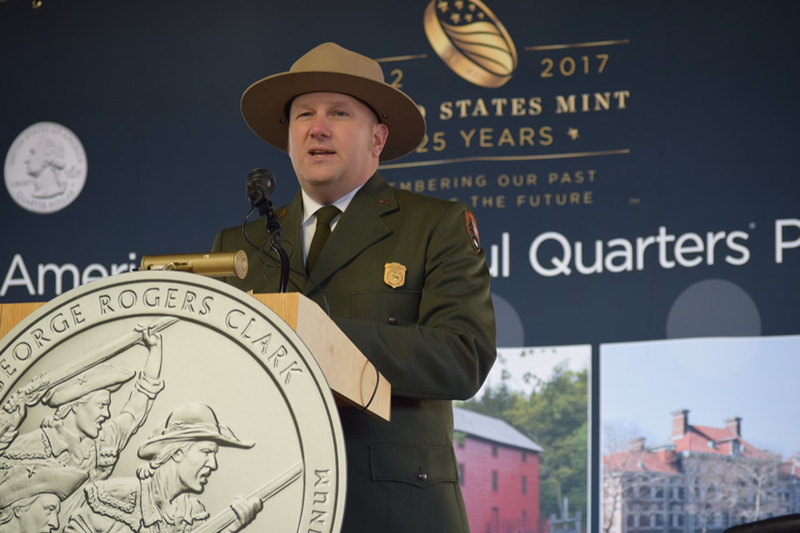 United States Mint Acting Deputy Director Dave Motl addresses the crowd gathered for the coin forum at the George Rogers Clark National Historical Park Visitor Center. U.S. Mint photo by Sharon McPike. The U.S. Mint’s America the Beautiful Quarters® Program launched in 2010 and will celebrate 56 national parks and other sites through 2021. 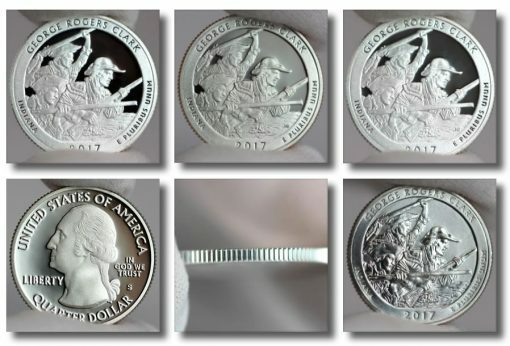 The George Rogers Clark quarter is the 40th released since 2010 and the last of the five unique 25-cent designs for 2017.